The bowls measure 18" diameter with a 1" track width. 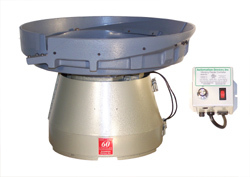 All of our vibratory feeder bowls are constructed of high-quality materials only! The bowls and cast rails are constructed of aluminum, the discharge covers are stainless steel and the wiper is A-Z tool steel and plated. Need the entire parts feeding system?